Week 1 is "Light The World"
Week 2 is "Light Your Community"
Week 4 is "Light Your Faith"
December 1st is Worldwide Day of Service. It's a good thing to post what you are doing this day, using the hashtag #LightTheWorld! They have included a Family Home Evening lesson and ask us to invite a neighbor or friend. Sunday, December 23rd, will be a special Sacrament Meeting focused on our Savior. And we again are asked to invite our neighbors and friends. Click here to be taken to the #LightTheWorld Website! Thousands of you last year downloaded our Primary Sharing Time and we received such good feedback. We decided to provide another Sharing Time for this year, but it is simplified from last year! 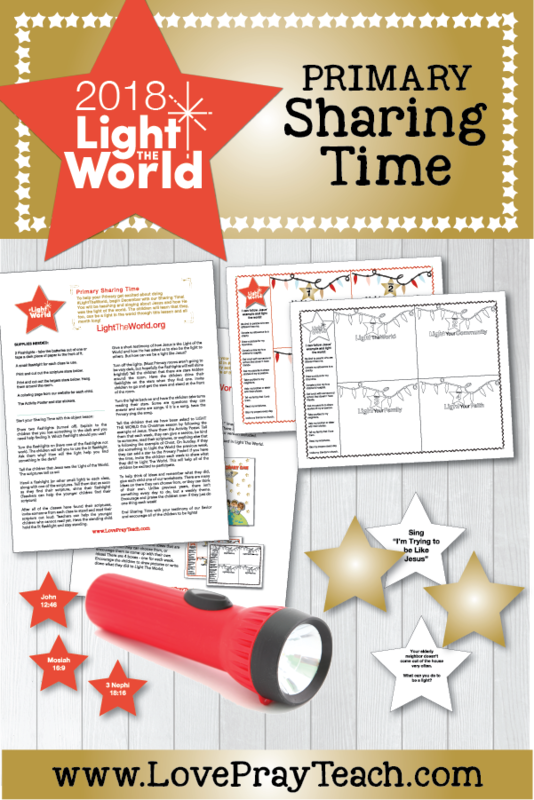 We have included a fun object lesson using flashlights, a take home activity worksheet, and an Activity Poster to hang in your Primary Room throughout the month of December! 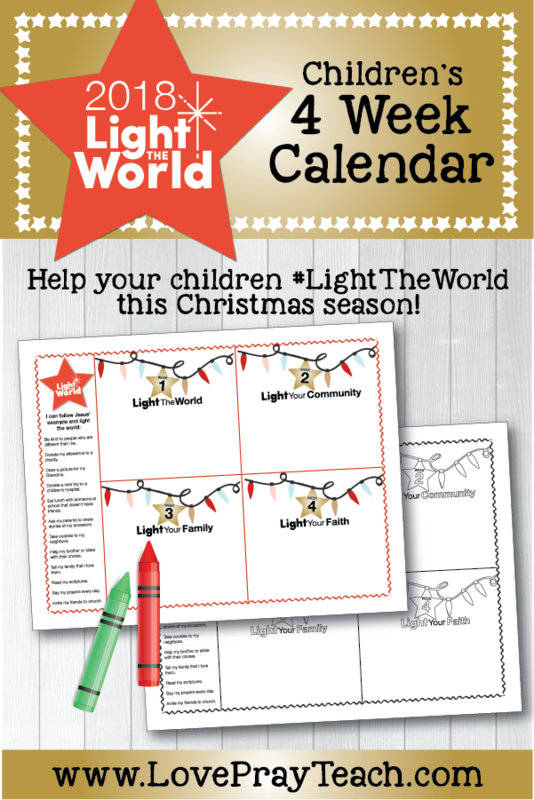 If you are not a Primary leader, but would like your own children or your Primary class to participate in #LightTheWorld, we have created these simple weekly activity calendars! There are ideas included that are kid-friendly that they can choose from, or have them come up with their own ideas on how they can Light The World each week! There is space provided for the children to write in or draw a picture of what they did each week to follow their Savior's example and #LightTheWorld. Encourage the children to hang up their calendar on the fridge or somewhere that will help remind them (and you!) to serve each week. 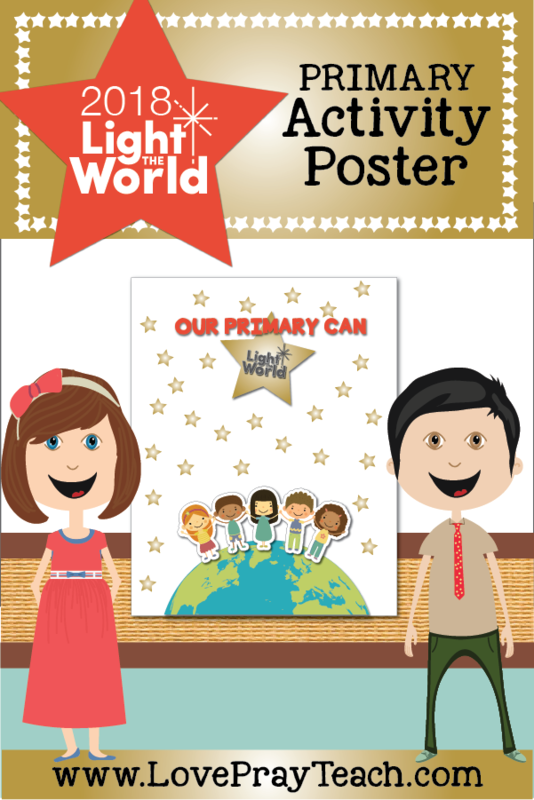 LDS Youth Leadership "How to Light the World in 5 Minutes"
Mrs. Lady Wordsmith "30 Ways to Light The World"
Party Like a Cherry "Lunchbox Challenge"
Life's Journey to Perfection "#LighttheWorld Bingo and FHE Idea"
Hey Friend Shop many cute printables and ideas! 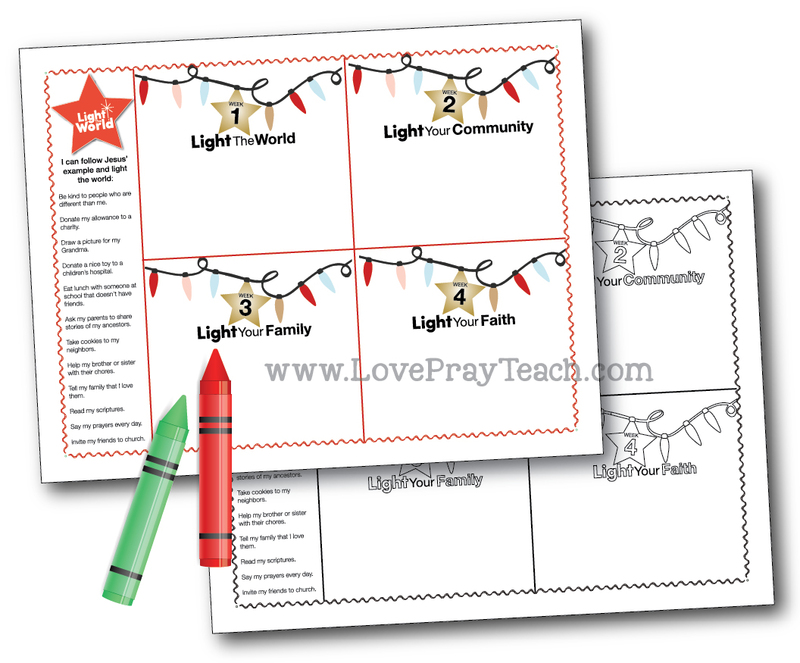 A Lively Hope "Journal Kit and Coloring Page"
Chicken Scratch and Sniff "Let Your Light Shine Lantern Project"
A Year of FHE "Children's Calendar"
If you enjoy our downloads, please share the following images on social media or pin to Pinterest!